Australian politician and 18th Prime Minister of Australia (after the disappearance of Harold Holt), was born at "Linden", Main Street Chiltern, Victoria in 1900. John was the eldest child of David James McEwen (d.1907), a pharmacist from Ireland, and his second wife Amy Ellen, née Porter (d.1901), who was Victorian born. David also had two children from his former marriage and another from his third. After his parents' deaths, John and his younger sister were raised in frugal circumstances by their maternal grandmother who ran a boarding house at Wangaratta before moving to Dandenong. Educated at local state schools, he left at 13 to help support the household. He studied at night-school, qualified for clerical entry to the Commonwealth Public Service, and joined the crown solicitor's office, Melbourne, in 1916. A member of the Country Party from the age of 19, McEwen stood unsuccessfully in 1932 for the seat of Waranga in the Legislative Assembly. At the Federal elections on 15 September 1934 he won the seat of Echuca in the House of Representatives. The Victorian Country Party had endorsed him while it was engaged in a bitter dispute with its federal parliamentary members. 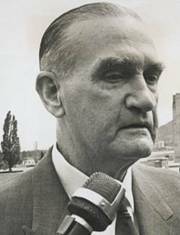 During the campaign McEwen clashed with (Sir) Earle Page, the party's federal leader. When McEwen arrived in Canberra he made peace with the federal party, thereby earning the hostility of his former colleagues in the State branch. McEwen's maiden speech in November ranged over issues, which were to preoccupy him in his parliamentary career: primary industry, commerce, trade, banking, employment and defence. It was the task of government, he said, to 'discover the basic facts upon which our national economy is founded, and search there for the root causes [of problems]'. His approach to politics and public-policy formulation was founded on this principle. He held the seat of Indi in 1937-49 and Murray in 1949-71. Harold Thorby defeated him for the deputy-leadership of the party in 1937. On 29 November that year McEwen was appointed minister for the interior in Joseph Lyons' United Australia Party-Country Party coalition government. Throughout his political career he had found relaxation in hard physical work on his cherished farm, Chilgala. In retirement he distanced himself from politics, undertook some consulting work, and travelled to Japan and South Africa. Survived by his second wife, he died on 20 November 1980 at Toorak and was cremated.